Fresh Local Beer – it’s what we pride ourselves on at HooDoo Brewing Co. Almost every beer we make is best consumed as soon as possible after it is packaged in kegs. There are exceptions to every rule, and our delicious barleywine blend “Mammoth” is one of those exceptions. We are pleased to announce the release of our 2015 Mammoth Barleywine Blend. The blend, which is packaged in 750mL bottles, is a first for our 2-year old brewery. 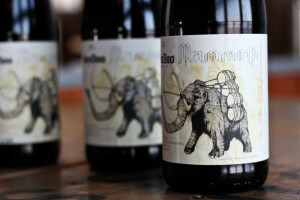 Hand-packaged, waxed and numbered, the Mammoth will be available for in-state sales at the brewery starting Saturday, January 31. 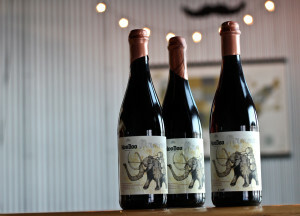 To celebrate, we will be re-releasing the Mammoth, the 2014 Barleywine and the 2013 Barleywine also this Saturday, for glasspours and growler fills. It will be a great day to be in the Taproom! The beautiful 750mL hand-packaged bottles will be $28 each, and are perfect for cellaring. How does Mammoth taste now? Incredible. The majority of this delectable concoction was aged in Dry Fly Wheat Whiskey barrels for 11 months, then blended with a small amount of 2014 and 2013 steel aged Barleywines. It’s a big beer, weighing in at 10.6% ABV. Rich malty flavors and aromas, with light whiskey notes – all smoothed out by 11 months in toasted American Oak. Drink one fresh? Absolutely. When aging hoppy beers, the hop components will degrade quickly and leave a resiny, muddled flavor. Hoppy beers are best drank fresh. HooDoo’s English Barleywine, released every January, is unique in that although we use hops to bitter the beer and balance out the malt sweetness, we use very little finishing hops for flavor and aroma. This beer is a showcase of delicious Maris Otter malt. Mammoth’s deliberate lack of finishing hops allow the malt flavors to stay at the forefront as they change and develop with time. Dark fruit flavors will become more prevalent over the next few years and the beer will be delicious, rich, and very comparable to a fine port. We would like to thank everyone who helped with this big project by staying after-hours, volunteering their time and energy so we could get these available. 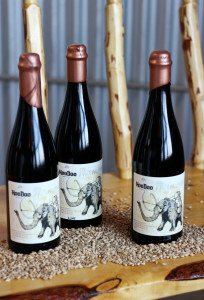 We touched each bottle through hand-filling, crowning, labeling, waxing then hand-numbering. Each one is unique. We’d also like to extend a thanks to the ever-talented, local artist Brianna Reagan for creating the great artwork for the label.